Today being Father’s Day, what better way of spending the day then with your son or daughter, picking up that NES controller and playing a 2 player co-op game? Today isn’t the day to be a lone hero playing Die Hard, or carrying on with Super Mario Bros 2, no today is the day of the offspring (not the US punk band). Yes you could pop in Contra or Super Mario Bros where your partner in crime will let you down due to their inexperience, so why not relax with a compendium of sports to play together with no hint of competitiveness whatsoever! And while your at it, why not play it on a cartridge that looks nothing like a regular NES cart? 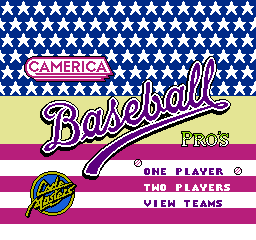 Starting with Baseball, you can choose from a number of worldwide teams to be and what is also good is that from the main menu you can view the stats of each time – that is if you know your stats, with points here and averages there. The rules of the game need no explanation but to win at the game can be quite difficult as it is hard to hit a home run. The graphics look bold and with good contrasting colours, and the animation with the pitcher is done well, however there is no detail in the faces of the players which may be something minor, but that coupled with the difficulty of hitting a home run it may be a game for statisticians only. Pick up Bases Loaded instead. 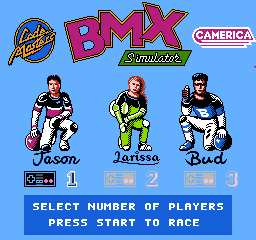 BMX Simulator takes you in control of Jason, Larissa or Bud depending on the number of players you have (with a maximum of 3) and choosing the difficulty of the game. The graphics here unfortunately do look bland and can strain the eyes with its brownish bland hue and at times difficult to navigate which way you are supposed to race in. There seems to be no clear signs unless you follow the competitors around. The bike can be difficult to steer if going at full speed, meaning your more likely going to crash into the walls than racing at full throttle. An average game but Super Off Road is better. 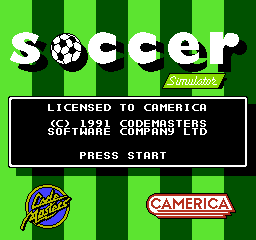 Soccer (or better known as Football) is your standard football game that graphically looks and plays like Super Kick Off with the overhead view. Although it doesn’t have USSR (instead having Russia with the Soviet Flag) it does have West Germany so being that the game was released in 1991 it may have needed to update the selection of countries. The game again is an average footballing game, personally Goal! is better however the game is very playable and what is nice is that every now and again it flashes on the screen that “Remember – A is to pass and B is to shoot”, I don’t know if takes pity on you or is an example of on screen controls that is now characterised in today’s games? Pro Tennis unfortunately shares the same issues as baseball – bold yet bland details and bad controls – it’s difficult enough to serve the ball let alone having a full rally. It has been said before and it has been said again – graphics are not the be all and end all of a game as long as you have solid controls and good gameplay. 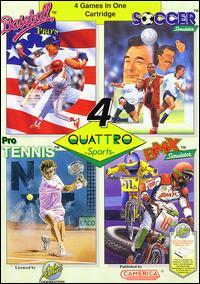 Pro Tennis has none of this, which is a shame but you’re best off even with black box Tennis rather than this version. 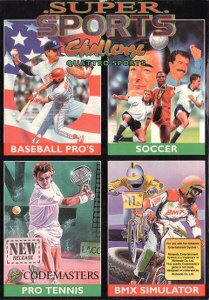 As different as the sports are on this game, they all share the same characteristics: Bland average graphics, upbeat jaunty music, broken controls and the distinct inability to actually win any of the matches you compete in. Finally, if you wanted to change the game you’re playing, rather than pressing the reset button to get back to the main menu, you have to turn the console off and turn it back on. You could argue that with stand-alone games you reset and it takes you back to that game’s menu, however with this game, it would be nice to make the selection without turning the console off and sometimes blowing into the cartridge to make it work! Overall, although the idea of having 4 games on one cart is a great idea (Super Mario All Stars anyone?…), in reality Super Sports Challenge was executed badly. 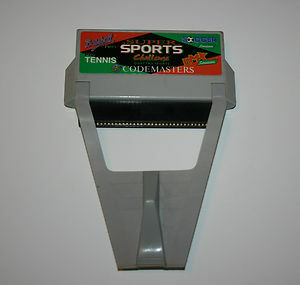 There are better alternative sports games to play, and your not saving time by swapping carts, as you need to go to the console to turn it off rather than resetting the machine when you want to play a different game. 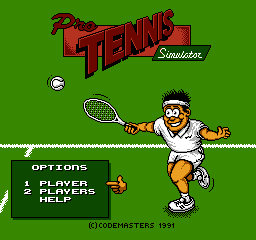 Yes there are better 2 player games (ahem Contra ahem Battletoads) to play but if you like the idea of a challenge, then this game is it – a challenge trying to hit a freaking home run or serve a tennis ball! Get out the black box gaming collection and have fun with them instead, I’m off to play with R.O.B and try to get him to call me Dad.